Sustainability — Hugh Starr & Co., LLC. Pi’iholo is blessed with abundant natural resources. The rare convergence of reliable water resources, reliable wind resources, reliable solar radiation, and deep soils. The Ranch is positioned at the very Transition Zone between two climate regions: the abundant East Maui rainforest and its opposite; the dry, sunny, leeward slopes. 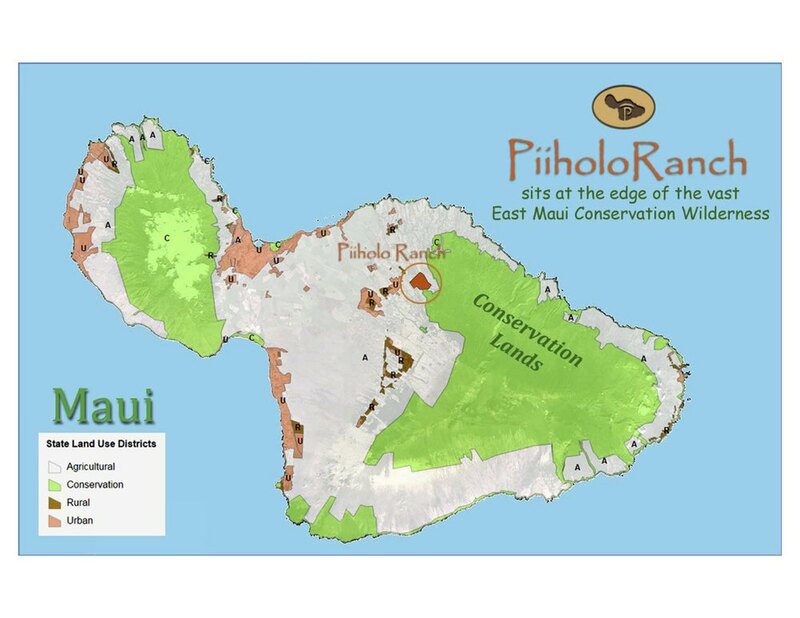 At 2,000 feet (600 meters) above sea level, Pi'iholo is where the upper reaches of the tropical growing zone & the lower reaches of the temperate growing zone merge, where many Native Hawaiian people of Old farmed and settled. It is where marvelously fresh Tradewinds meet lighter, drier Leeward Convection Winds. Pacific Ocean’s Northeast Tradewinds re‐freshen these remote Hawaiian Islands 7 of 10 days each year, on average...these Trades bear the twin offerings of predictable cool ocean air & fresh pure rainfall. An ancient geologic relic of Haleakala Mountain's formation standing as a distinctive land mark prominent on Haleakala's flan and providing a penthouse-like perspective across the Island valley shrouded with steep Forest Woodlands. Wrapping around Pi’iholo Hill’s broad base is Waiahiwi Stream, secluded and sometimes abundant with fresh rain water, sometimes quiet, a tapestry of natural water features and delicate streambed estuaries. Numerous varieties of Australian Eucalyptus tree were planted at Pi'iholo a Centuryago initially to supply then wood-fired sugar mills, to define land boundaries, and to provide wildlife shade and wind breaks. Today, approximately 90 acres of this immense heritage remain standing within Pi'iholo Ranch. Also remnant stands of Hawaiian Koa and other native varieties survive today, mostly deep in theprotected gulch environments. Family & guest hunting/gathering pursuits include Axis Deer, Hawaiian Mountain Pig, familiar Hawaiian country-side wild fowl such as ring-neck pheasant, and quail. In the center of the Ranch there has been created a protective safe harbor facility for a flock of Maui's endangered Hawaiian Nene Goose; the exclosure also provides safe habitat for plantings of native plant species.